How is it halfway through 2013 already? Does time seem to go this ridiculously fast for all new parents? It’s almost July and she’s already 9 months old. It’s insane how it keeps spiraling. I had 2 women approach me in the grocery store this weekend to tell me how cute my baby was and how they remembered when their girls(now school aged) were that small. The wistful looks on their faces told me it just keeps moving faster and faster. This weekend I went to my first concert since she resided in my belly. It has been over a year since I went to a show and it was wonderful. I was a nervous wreck before leaving(what if she wakes up and freaks out, what if she’s hungry and won’t take a bottle, what if she gets scared). But she did great, she has the best grandparents in the world watching her and the show was amazing. Last time I went to a show she was in my belly, just starting to swim around. The difference in who I am since then is astounding. I wished she could have been there too, strapped to my chest in the ergo. I may have even teared up a bit when this song about organ donation came on. Yes I am that lame. This weeks photo is of a morning sink bath. She loves baths and water in any way shape or form. 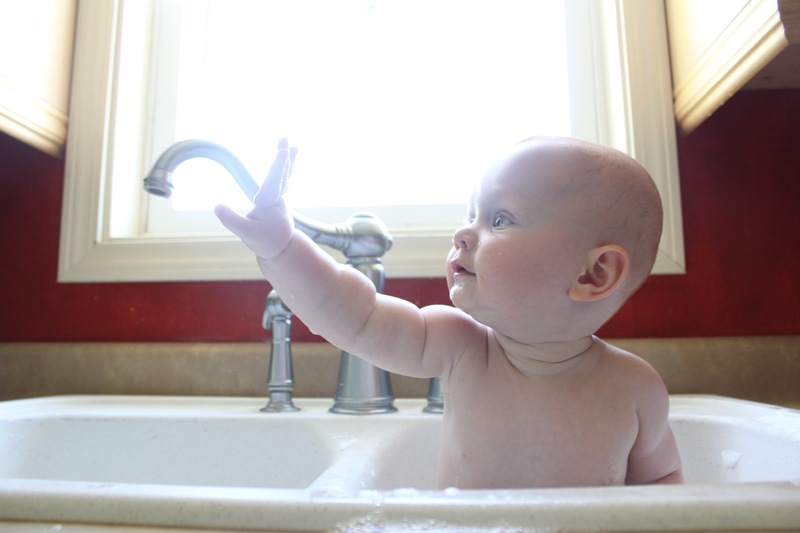 Although the sink baths may have to go pretty soon as she is learning to climb out of the sink. Little baby naughty. I swear I would build this kid a pool if we owned this house. Last week I loved this photo, a very familiar scene in our house, the best toys are not really toys at all these days. What is breakfast like in your house? Is it different on the weekends? I love breakfast. I love the ritual of it. These days my breakfast routine involves a small wild animal(the baby) spinning herself in circles on the floor while squealing at the cat. She shrieks, and the cat rolls over as if saying pet me more! And her “petting” is characterized by pulling handfuls of fur out of kitty. But that cat, I never would have thought it would be the cat, that is sooo patient and gentle with her. She loves that baby. So while the cat and the baby have their morning playtime, I make her and I breakfast. Sometimes it’s easier to just make her breakfast while I have something at the ready. She loves scrambled eggs. She will eat an entire egg when I let her. I always mix something green in with her eggs. Not that I need to hide it in there. Her favorite foods these days are all green. Quinoa Chia Seed Granola. It sounds super hippie-ish right? I’m pretty sure it borders on hippie. But there are waaay more things I could have added and didn’t. I tried to keep it along the lines of plain granola at least somewhat for my husbands sake. Granola is a great make-ahead breakfast for the week. It’s easy, quick and cheap. I made this up in a matter of minutes and then just stirred periodically while it baked away. The secret to the best granola is to turn the oven off when it’s almost done, and then walk away. For a few hours. It bakes in every bit of syrupy honey goodness and toasts the oats and almonds to perfection. 1. Preheat oven to 325 degrees. Line a 9×13 baking dish with parchment paper. In a large bowl mix oats, almonds, quinoa, chia seeds, cinnamon and salt. In a small saucepan heat oil, maple syrup and honey until warm and well combined. Add to oat mixture and stir until well coated. Spread in an even layer in baking dish. Bake for 45 minutes, removing from oven and stirring every 15 minutes. After 45 minutes have passed stir again and return to oven, turning oven off. Leave until completely cooled. Somehow I managed to take very few photos this week. Which is kind of insane considering how many I take normally. I did shoot a decent amount of video of this child. I keep thinking I’m going to forget what she sounds like or moves like as time passes so I’m trying to capture as much as possible. This weeks photo comes from the doctors office, yet again. An iphone snap as I apparently mostly shot video with my actual camera. 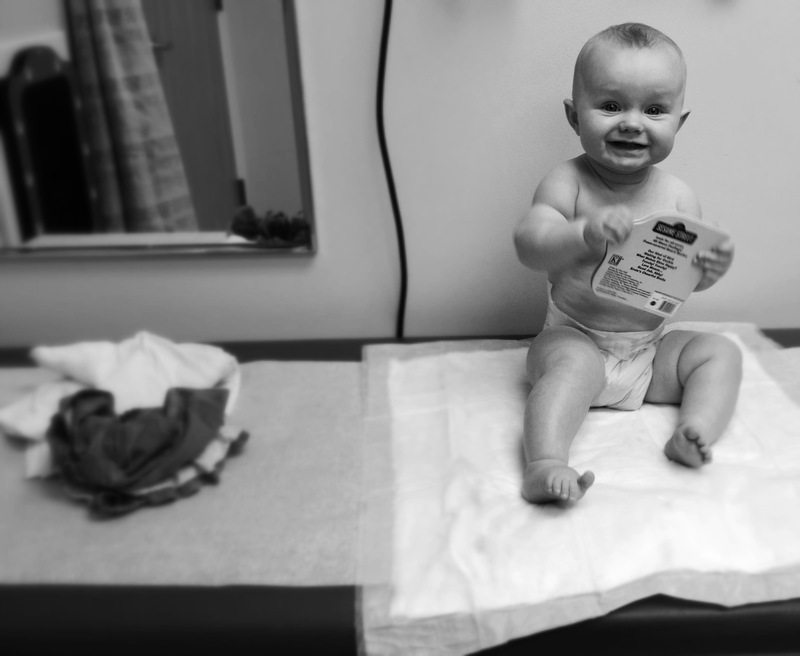 Her 9 month check up, which luckily did not include any shots. This kid sure spends a lot of time in doctors offices. I looked at her past appointment list the other day, and it was 3 pages long. In a way it’s nice, because she’s so used to it, she’s very happy at the doctor these days. I’ve been worrying about her again. I find myself doing so every time I decide to catch up with my online community of heart moms. Sometimes I think I need to just stay away from those sites, but I do like having other people with kids like mine to interact with, even if its only online. But the group brings the good stories and the bad, which of course make me worry. It’s something I’m working on more and more. Staying present, living in the now, accepting the past and welcoming the future. Last week I liked this photo. I fear one day far to soon, my little girl will tell me to stop photographing her. And I will probably cry. For real. Do you ever find a dessert that you simply can not get enough of? Like get me more of that right now or I might hurt someone? These are that dessert for me right now. I saw them last week on Shutterbean, and thought about them and went back to the post for days before I finally made them. And then did this whole “holy crap why didn’t I make these sooner” thing in my head. These are AMAZING. So good. 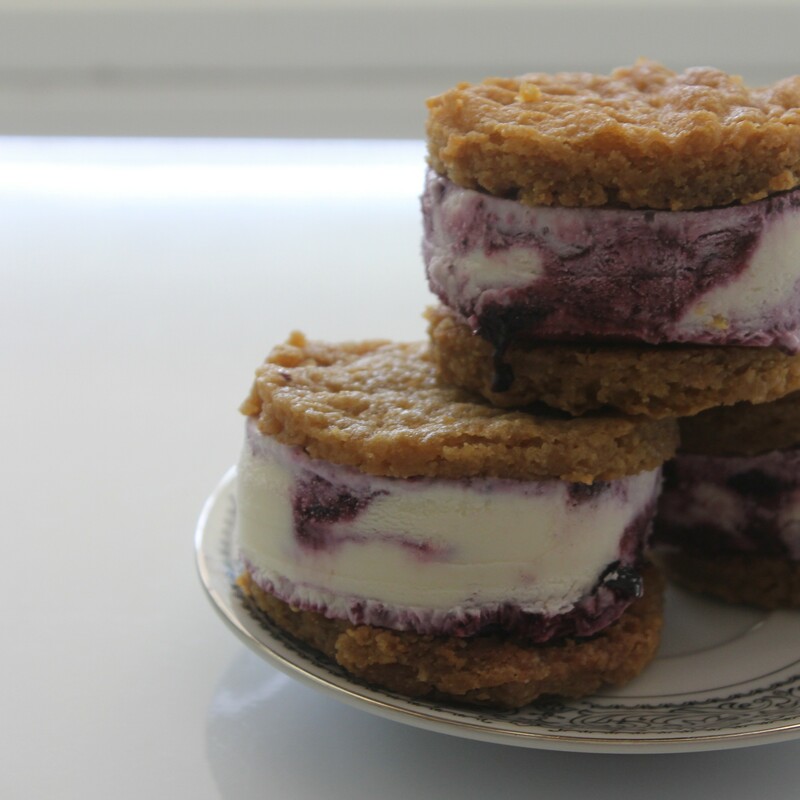 I’m a huge ice cream fan, and throw in lemons, blueberries and cookies… well that’s just dangerously good. The cookie gets even better made soggy and soft by the freezer and the ice cream. I let my babe have a lick of one of these and her eyes lit up and a loud “mmmmmm” escaped her lips. Kid knows her foods. I’m pretty sure I ate 4 minis in the span of 30 minutes. Thank god I’m still breastfeeding so what I eat doesn’t really count. I adapted this recipe just slightly. 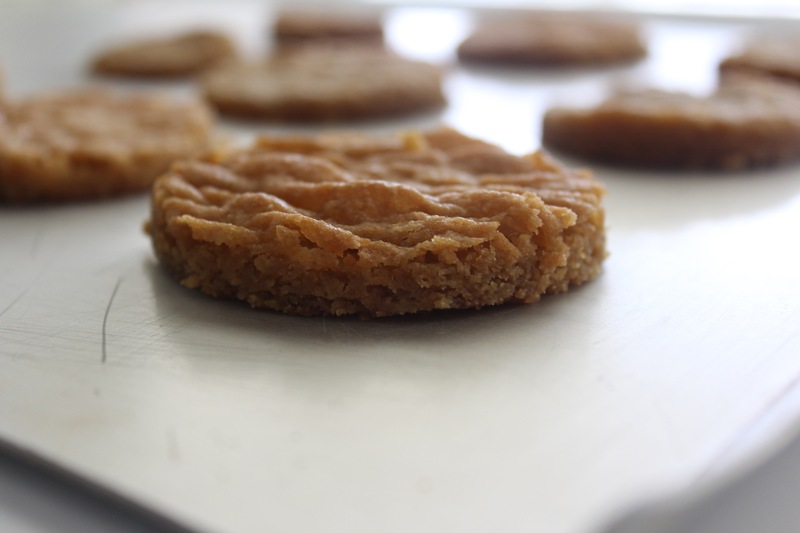 I’ve found lately that I like all cookie recipes better when I skip the brown sugar, and use white sugar and molasses instead. Brown sugar is basically just white sugar with molasses still in it, but something about adding it myself makes the cookies sooooo good. Maybe I’m heavy handed and I add too much. Whatever it is, it lends this deep flavor to everything. The ice cream here is easy. You just dress up some store bought vanilla. Buy the good stuff. I bought this ice cream. A favorite of mine for a while now, although I do wish they would offer an organic option(one thats sans xanthan or guar gum, and all those other fun stabliziers). Next time I will make my own ice cream, but I was too impatient this round. The blueberry compote took all of 5 minutes. The cookies were done in 20. Super quick and easy. And oh so good, did I mention that? I can’t handle the goodness good. Get in my belly right now good. Make these tonight. See if you can stop eating them. I’m betting you can’t. 1. Make lemon ice cream: Let ice cream sit out for 10-15 minutes at room temperature, until it reaches the consistency of soft serve. Transfer ice cream to a large bowl and stir in lemon zest and juice. Cover the bowl with plastic wrap and freeze while making compote and sandwich layers. 2. Make blueberry compote: Cook blueberries, sugar, and zest in a 12-inch heavy skillet over medium-high heat, thoroughly crushing blueberries with a potato masher, until juices are released and sugar has dissolved, about 2 minutes. Add lemon juice. Transfer blueberry compote to a bowl and chill until cold, about 1 hour. Discard lemon zest. Dollop compote in ice cream by the tablespoon, swirl into ice cream. Transfer ice cream to a 8×8 baking dish and freeze until firm, about 4 hours or over night. 3. Make sandwich layers while compote chills: Preheat oven to 375°F with rack in middle. Butter 9×13 baking pan and line with parchment, leaving a 1-inch overhang on each side, then butter parchment. Whisk together flour, baking powder, baking soda, and salt in a small bowl. Beat together butter and sugar in another bowl with an electric mixer at medium-high speed until pale and fluffy, about 3 minutes. Beat in egg, molasses and vanilla. At low speed, add flour mixture in 2 batches, mixing until just combined. Spread into thin, even layer in baking pan with offset spatula. Bake until golden-brown but still tender, 15-20 minutes. Cool completely in pan, about 30 minutes. 4. 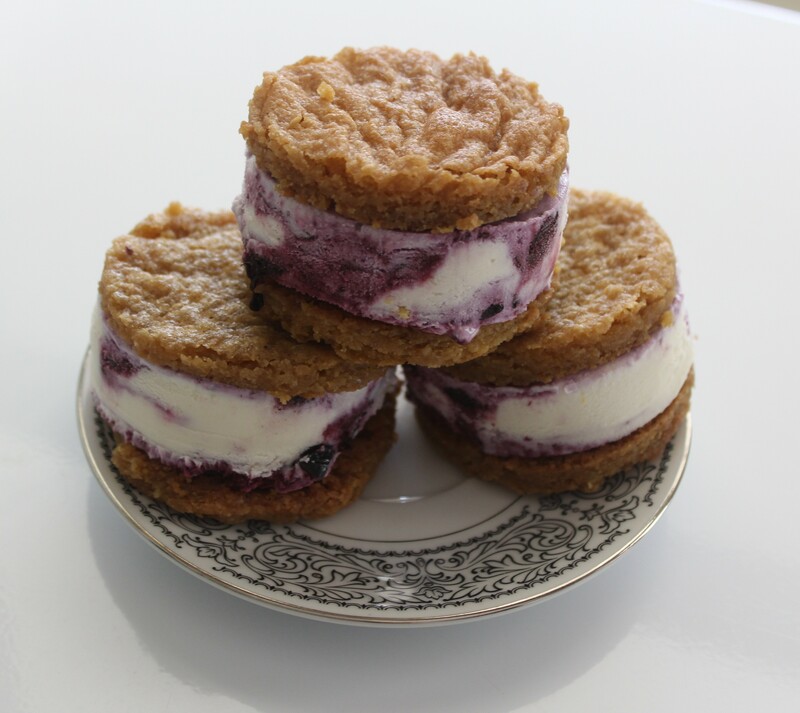 Assemble sandwiches: Using a circular cutter or a glass cut rounds out of the ice cream and cookie layers. Sandwich together, wrap in plastic wrap and freeze until firm. This is her “stop taking my picture and let me chew on that phone” look. She’s 9 months old today. 9 months. Almost as long as she spent inside of my body. She’s growing and changing and getting smarter every single day. She amazes me on a daily basis. She takes my breath away. I still struggle on her month birthdays, as it makes me remember the day she arrived. I realized tonight I only got to spend about a few minutes with her that day. I saw her twice. For a few fleeting minutes. I barely remember it. I’m still coming to terms with that. Her dramatic entrance. But it fits her. She is my little drama queen in every sense of the word. Quite a perfect blend of her momma and papa. She melts my heart. Happy 9 months little girl, you’re growing too fast. It’s starting to get hot here and I am so happy I am not spending this summer hugely pregnant. As the temperature rises I am reminded of how miserable I was this time last year. Pregnancy was largely unpleasant in my experience. No, scratch that, pregnancy sucked for me. Big time. I love this kid and she was worth every second of misery, but it was straight up awful. And the hottest summer in years did not help. I hate the heat. I’ve said this numerous times. It simply makes me uncomfortable. And my daughter is proving more and more to be the same. I’d venture to say she gets hotter even easier then I, considering the amount she sweats. It seems to be one of the only outward signs of her special little heart. 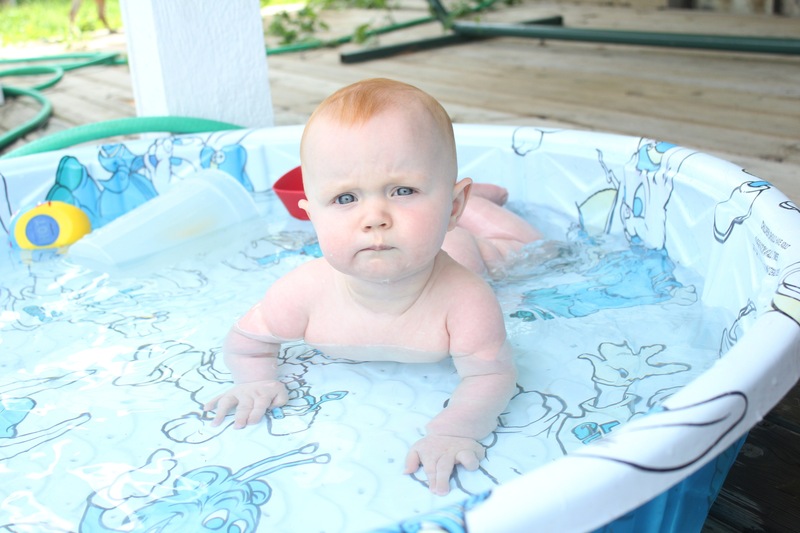 She has continued to love her swimming class, so on hot days I’ve been filling up the little pool and letting her splash around. Off comes the diaper and she spends a good hour splashing, spinning around and around, trying to use the edge to stand, picking grass over the side and playing with the toys I throw in. We have a very large covered porch so I can even keep her fair skin out of the sun. I can’t wait to take her to a lake sometime this summer, although all of the ones in town are so polluted and disgusting, I fear we may need to travel north a bit to do so. Last weeks portraits were among some of my favorites. I love to see the progression, it seems the photographs are getting better and better. I loved these portraits, they all seem so oblivious to the camera, quite the opposite in the first photo here, that stare is gorgeous. These were my absolute favorites last week. The light, the moment, the editing. I loved it all, and sometimes an iPhone is all you need to capture it. I love pancakes. My husband used to love pancakes. I don’t know what happened. I think I made him too many pancakes. 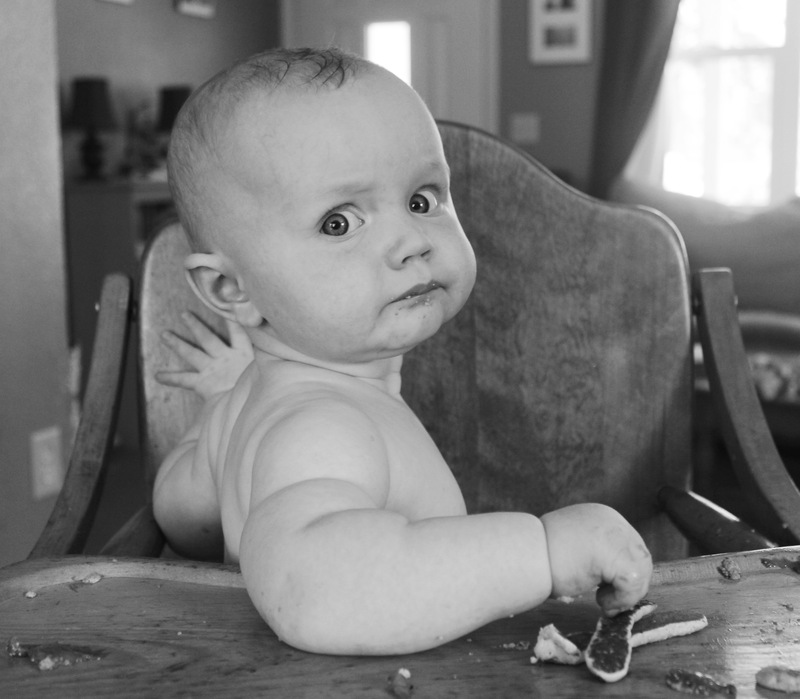 I’m pretty sure my baby will love pancakes. So I decided to make her some and test the waters. I’m totally feeding her way too many eggs so something else had to come into the breakfast routine. I’ve been avoiding wheat for her diet until she is a little older, not because I’m worried about allergies, but I don’t feel like it holds much nutritional value for her right now, and she gets constipated quite easily. So oat pancakes it was. 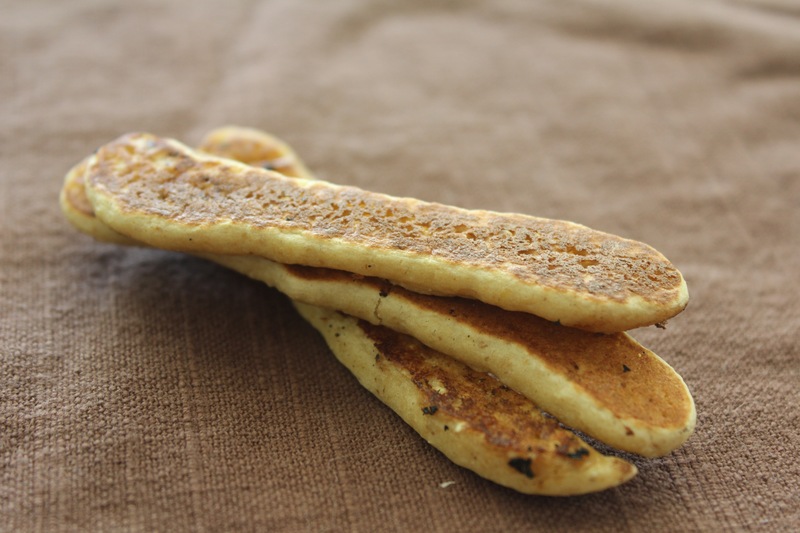 Pancake sticks for her. 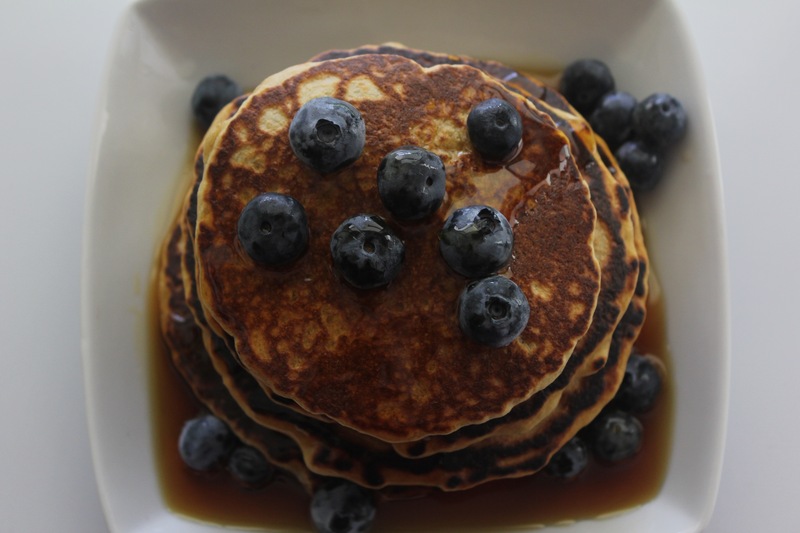 Fluffly blueberry pancakes with loads of maple syrup for me. She has yet to learn to love berries. I’m guessing as the summer progresses and they get sweeter she will be more interested. These pancakes do double duty(possibly even triple). If you also happen to be a momma breastfeeding a babe, oats are wonderful for helping your milk supply. If you’re anything like me, you simply can not eat oats more then 1 or 2 days in a row or you will be overflowing with milk. 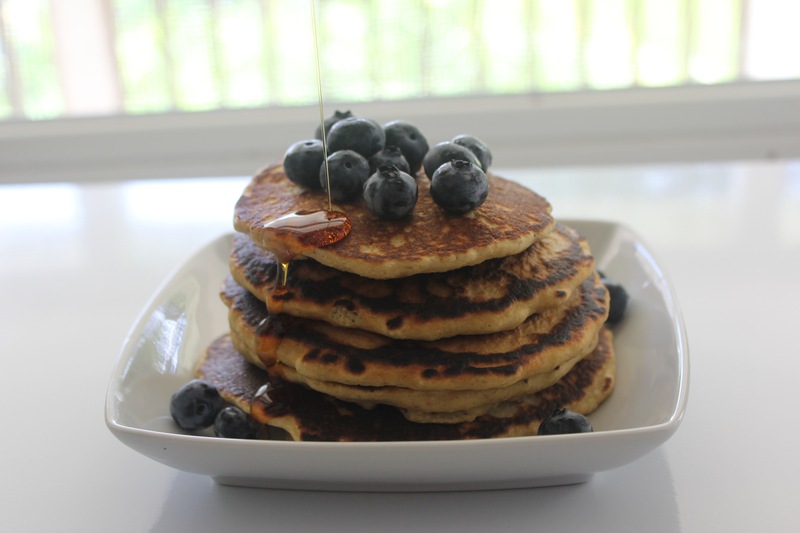 Oh and guess what else, these pancakes are gluten free! Totally unintentionally, but hey, my first gluten free recipe! 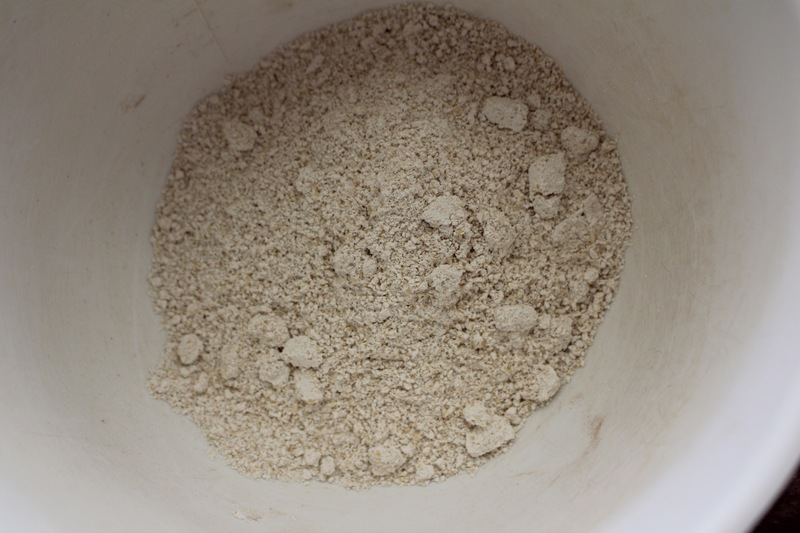 Did you know that oats grind up into flour incredibly well? So easy. I’ve used this flour in cookies before, to give them a bit of that oaty flavor without the texture of oats. It works great. Depending on how much you grind the oats, you are left with a bit of bite in the flour(which I quite liked). This batter would be suitable for a waffle iron as well, it puffs quite nicely. To grind the oats, I simply measured out the amount of flour I would need and it translated perfectly. I put 1 1/2 cups of oats into my magic bullet(yes I have one and seriously use it constantly) and ground into a fine powder. 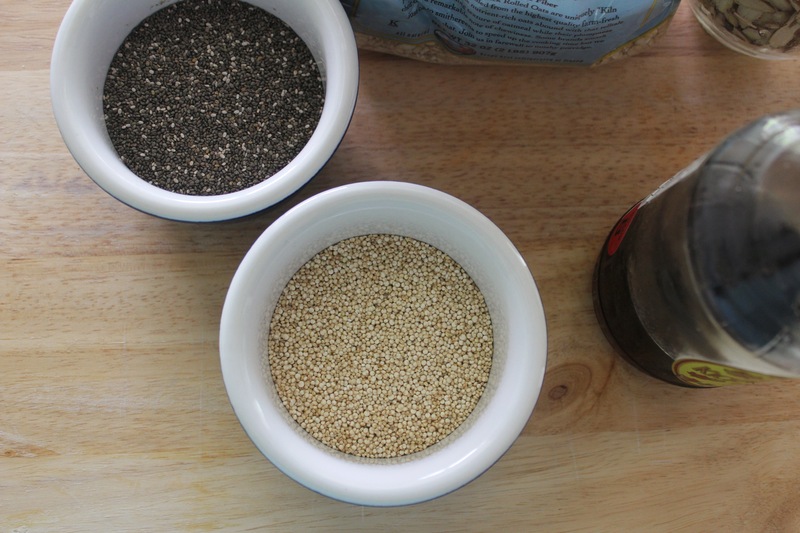 You could probably use your blender for this, but you may need to make a larger batch of oat flour depending on the size of your blender. To make the pancake sticks for my litte monster, I simply put the batter into a squeeze bottle and piped little sticks perfect for grabbing into the pan. Days like today I relish being able to work part time. Do I wish I stayed home all the time? Well yes, but having those hours in the morning and early afternoon with her, to cook her breakfast, to take a walk, to snuggle up for a nap. These are memories I want to have forever. I know someday all too soon, she will be standing and walking and then helping me in the kitchen. These things I can not wait for, but desperately want them to hold off just a little bit longer. I find myself wishing lately we had recorded more video of her when she was so small. I see other newborn babies and I literally do not remember her being that way. Maybe it was the haze of living in the hospital for a month that erased those memories for me. Or maybe I simply never allowed myself to see her that helpless, because I needed her to be strong and fight like hell to get home. To come home so that I could be the cooking and baking momma I was meant to be. 1. In a medium bowl mix flour, baking powder and sugar. Stir to combine. Add milk, egg, vanilla and oil. Whisk until no lumps remain. Let rest. Heat up a griddle over medium heat. Add a bit of butter or oil to grease the pan a bit. Pour approximately 1/4 cup of batter into pan. Drop blueberries onto surface of pancake. You could mix them in to the batter if you prefer, but I like how they almost caramelize when their skins are exposed to the pan. Once bubbles form on the surface and pop, pancake is ready to be flipped. Cook until golden brown on blueberry side. Serve with a hearty drizzle of maple syrup. I am feeling like time is flying again. 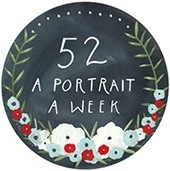 I say that every week, but week after week things seem to spiral quicker and quicker. The days fly by. The minutes while at work however, drag. But the second I walk through that door time spins. I treasure every moment with these two. My husband and I were talking about it today, while sitting on that blanket, at a festival in a park, filled with people. How lucky we are. How the little moments, where it’s just us three, even in a sea of others, how totally and completely lucky we are. How those little moments are so perfect. Someday we may not remember them, so we try to drink them all in. 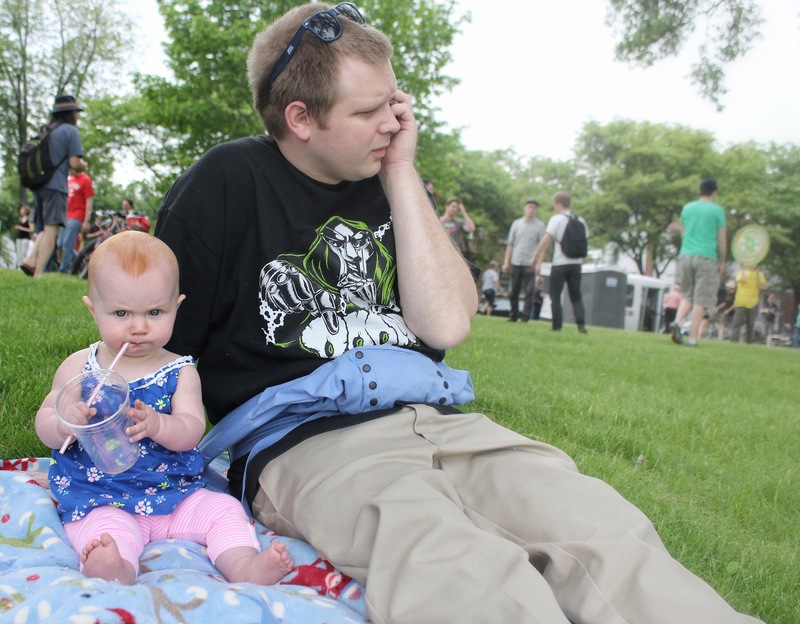 She loved the park, and the festival, the crowds of people and the booming music. I knew she would. 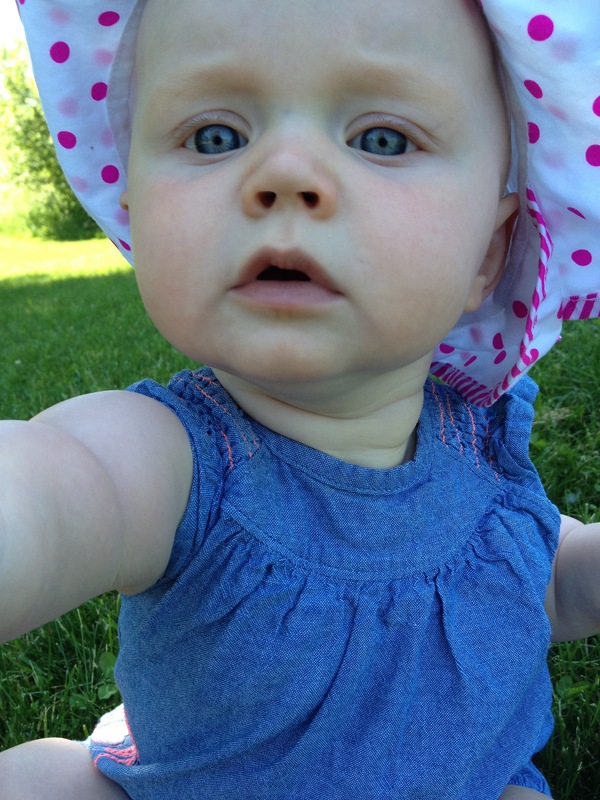 She was born to be social, from the safety of her ergo at least. This kid will go anywhere, do anything, as long as she’s strapped to our chests. We ate brats(it’s summertime in Wisconsin, there’s a lot of brat eating going on), drank smoothies, and had ice cream. She has been learning to drink smoothies from a straw at home and did quite a lot of damage to the smoothie today. And then demanded the cup and straw as payment for not being allowed more. I even let her try my ice cream. And then she kept wanting more. She is her parents daughter. That goofy look she gives the camera kills me. It shows up quite frequently, and cracks me up. I wish our Saturdays could go on forever. They never cease to amaze me. Maybe that’s part of being a parent. Does everyone feel this in awe of their children? It’s a wonderful feeling. I’m certain someday when she’s grown, and going off to college, I will weep remembering these days when she was so tiny and lovely and mine. Last week I loved this black and white. The light, the leaves, the tiny person. It is my ideal of fall. This gesture is gorgeous, and I have a feeling I will be seeing it all too soon. And finally this tiny babe lost in a sea of grass, had a painterly quality I found I kept coming back to. Food memories. Do you have them? Do they stick out for you the way they do for me? I remember things, on many occasions in terms of taste and smell. A Little Debbie Nutty Bar can bring me back to my grandpas basement, where my brother and I played and ate as many Nutty Bars as we could get away with. There was a Blatz beer sign on the wall and some tool in the back room that my brother and I were convinced was an anvil. Pretty sure we watched a lot of looney toons and tiny toons at that point. I can’t remember when I had my first cream puff. I remember my mom always talking about her sister making them on the farm, and eating them at the state fair. I always loved cream puffs. Heck I always loved cream. I was that kid, who upon eating at a restaurant, would promptly down all of the little creamers on the table. I remember as an adult, going to the state fair with my mom and aunt and waiting in long lines for cream puffs. 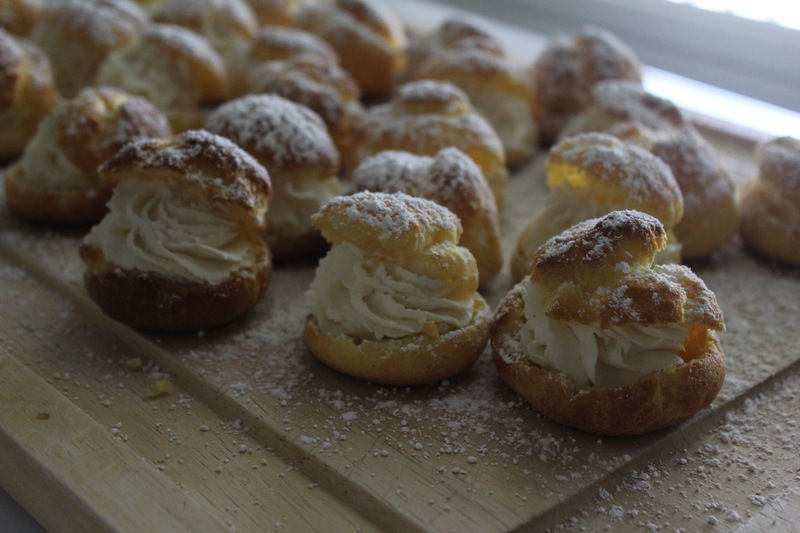 Now that I’m all fancy with the baking, making cream puffs is something I’ve done over and over. 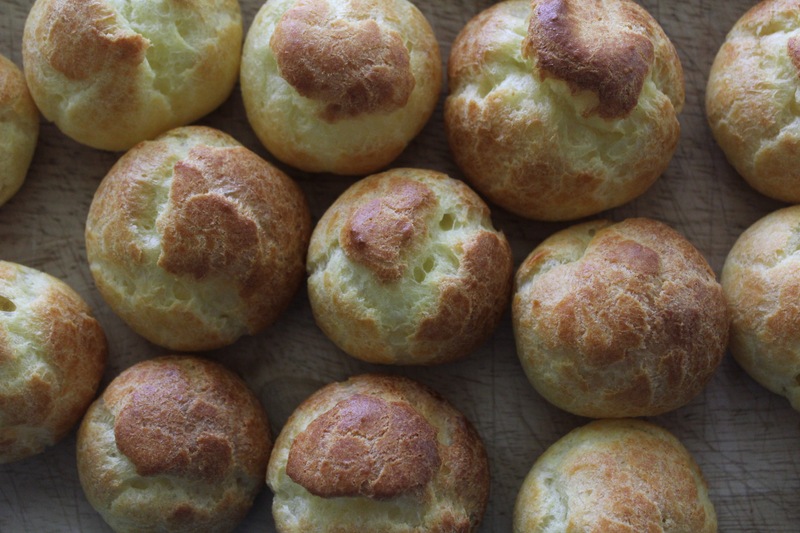 And here’s a secret: cream puffs are easy! They are one of the easiest desserts to make, and they look so difficult. And the pastry? It’s called Pâté a Choux. It’s french and is harder to pronounce then it is to make. 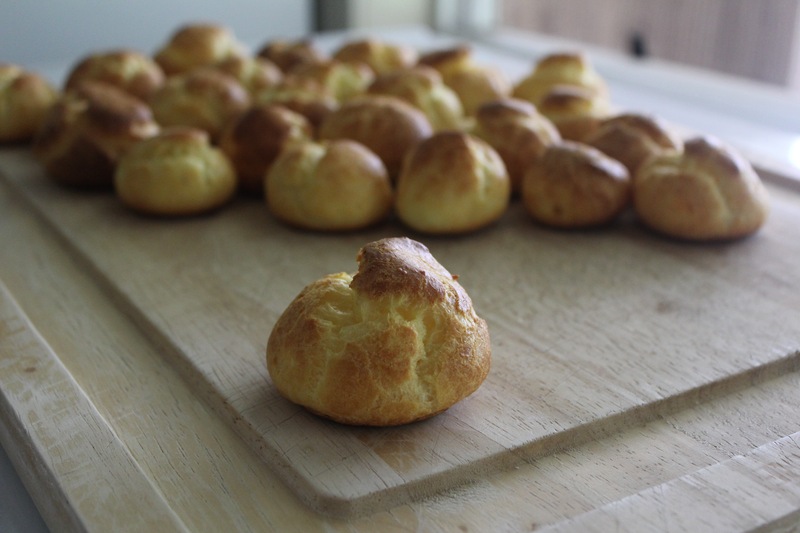 It’s a basic profiterole pastry. It’s super versatile. Add some sharp cheddar and chives and you have savory cheese puffs. It’s as simple as this, butter meet milk and salt. Melt and get hot. Add flour and stir, stir, stir. Beat to cool off, eggs in one at a time. Pipe and bake. The eggs do all of the hard work. Cream gets beaten, fill and boom. 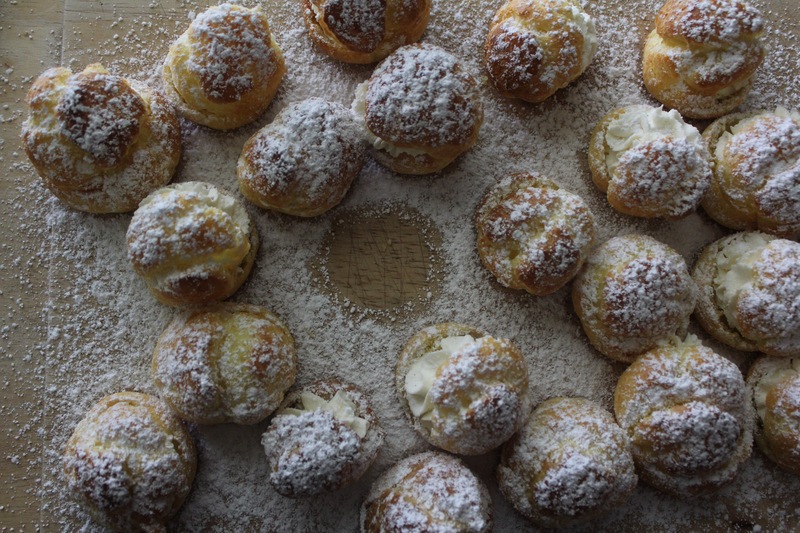 Cream puffs. E A S Y. 1. In a medium saucepan over medium heat combine milk, butter and salt. Heat until butter is melted and it just begins to simmer. Add flour all at once and stir with a wooden spoon. Dough will come away from the sides of the pan. Transfer dough to a mixer or food processor and beat until slightly cooled. Add in eggs, one at a time, beating after each addition. 2. Preheat oven to 425 degrees. Line a cookie sheet with parchment. Transfer dough to a piping bag with no tip(you can use a ziplock bag if you don’t have one) and pipe balls approximately 1 inch high and 1 1/2 inches wide. Wet your finger and tuck in the swirl at the top of each puff. Bake for approximately 25 minutes, until tops are golden brown and puffs sound hollow(hint: if they deflate when you remove them from the oven, they’re not done). Cool completely. Cut each puff in half. 3. Using the whisk attachment beat cream on high until soft peaks form. Add in vanilla and confectioners sugar. Beat on high until stiff peaks form. Pipe or spoon into puffs. Dust with more confectioners sugar. Serve immediately. Today was the highlight of our week. Saturdays always are. There’s the farmers market with tamales and pastries for breakfast in the morning, followed by swimming. Then the rest of the day is wide open. Nestled between naps comes errands and time well spent with the people I love the most. 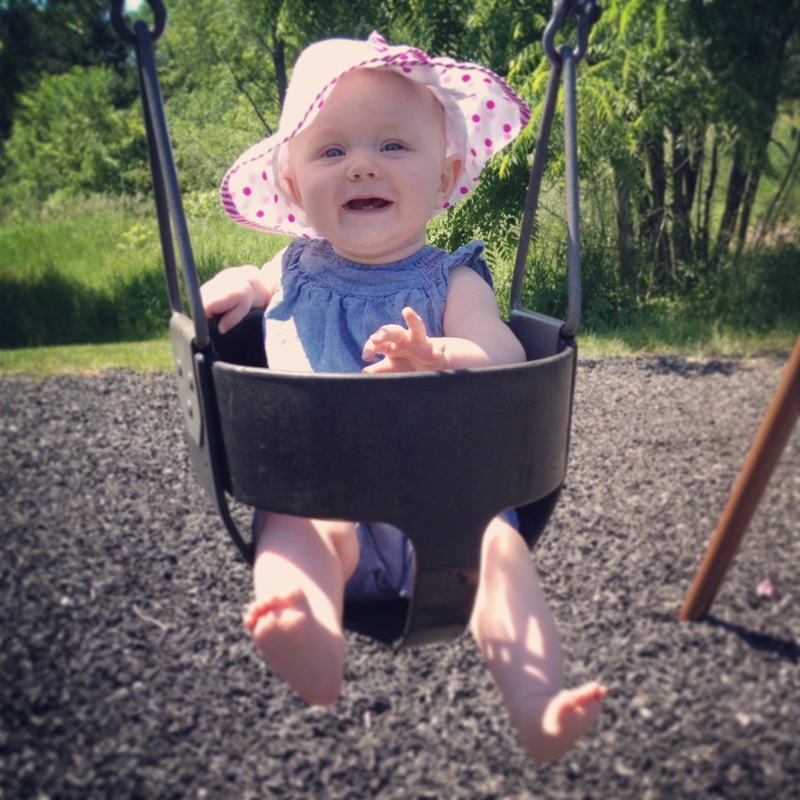 Tonight we had a picnic in the park and she went in a swing for the very first time. 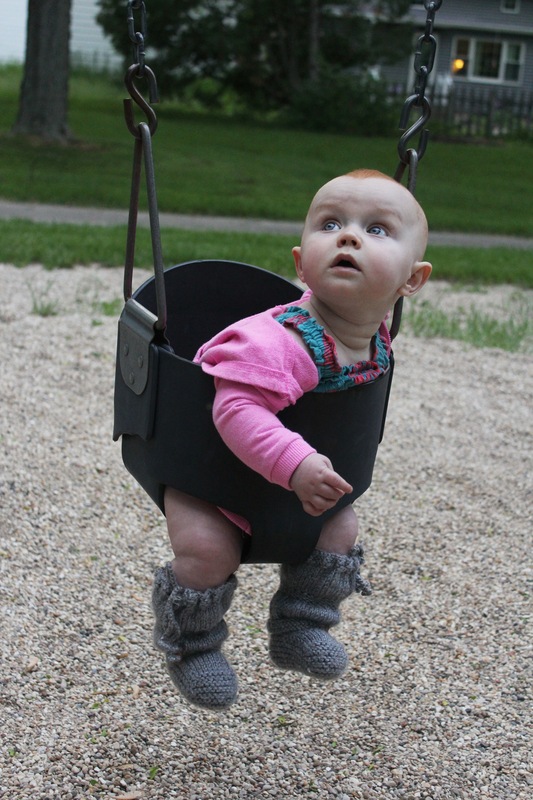 She was a bit unsure at first, but once papa jumped on a swing close by she was sold. I love this girl. I can’t say it enough or in the right way to ever truly express how much. If you would have told me two years ago I would live to see my child smile I would have laughed at you. She is simply amazing. Last week I quite liked this photograph. And this one(again, I know it’s becoming a theme. She really is a lovely photographer). It’s also possible I am drawn to photos of babes and their dads. There’s something especially sweet about it.